Regardless of how many times you go to Rome, it is always exciting and your days seem packed with new places to see and things to do. As you are arranging your itinerary, try include at least one-day venture to an outlying region to experience other sites that are equally as interesting and impressive. These day trips from Rome may provide you with some different experience. Even those who are not Catholic have heard of St. Francis of Assisi. Since being declared a Saint, he has been adopted as the patron saint of Italy and his burial site in Assisi inspires pilgrimages to this hill city of Umbria. If you are a cave lover, don’t miss a visit to Eremo delle Carceri to explore the caves of medieval monks. How to Reach Assisi: The easiest way to Assisi from Rome, if you are not quite fluent in Italian, is by signing on to a day tour. But, if you are an adventurer, then it is faster to take a train than a bus. Rail-Europe has trains to Umbria at a reasonable rate. However, you should know that you will need to transfer at the Orte Station, and then take a bus into Assisi on arrival. Travel time: Approximately 2 hours plus the bus trip. If you decide to visit Assisi, you can save time and add Orvieto to the same trip since they are in the same region. Orvieto’s Cathedral is known for its magnificent mosaic work. Supposedly, it was this cathedral’s frescoes that influenced Michelango’s work at the Sistine Chapel. You don’t want to miss Orvieto’s Labyrinth of underground tunnels carved by the Etruscans a thousand years before the Christian age. There are rooms that are elaborate enough to be transported to any palace in the world today. How to Get Orvieto: Take the regionale train from Rome to Orvietoinstead of the intercity train. Regionale does not accept reservations so you will have to be at the Termini station about 30-minutes in advance of your departure time to purchase your ticket. Tuscany is a favorite destination for day trips from Rome. Plant yourself in Piazza del Campo (the main square) and grab a bite to eat while immerse yourself in the flavors of the city and wonder at the Torre de Mangia in the plaza. How to Get Siena: The best choice is to take the bus from Roma Tiburtina bus depot and it will deposit you at Piazza Gramsci in central Siena. You can purchase a ticket and check times online or at the bus depot if you don’t know what day you want to go. The Amalfi Coast encompasses many different towns, each with a romantic name and fabulous food. If the name Salerno sounds familiar, it is probably because you heard someone make reference to it as the Allied Beachhead during WWII. Today, the town is a popular port where fresh sea food abounds. Rovello offers up an 11th century cathedral that is of interest and is considered by artists and authors as one of the most romantic small towns in Italy. West of Amalfi is the hidden Grotta dello Smeraldo on the road to Positano and Praiano. This is a sea cave with spectacular emerald green water and you can tour it by boat. This is the same area of the Vallone di Furore, Italy’s version of the Grand Canyon. You may want to choose one of these coastal towns to spend the night and head out in the morning to Naples to catch a ride to the Island of Capri. 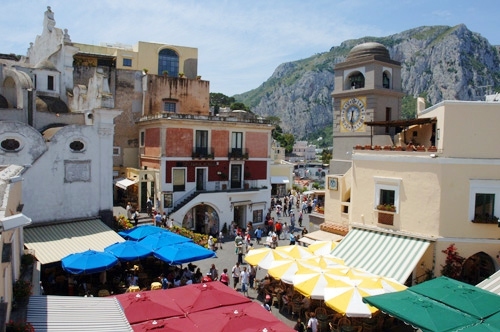 Capri is also one of the best choices for day trips from Rome. Most people either arrive by ferry or take a hydrofoil over the island and spend the day meandering through the streets, visiting local museums and eating. As a matter of fact, eating is the prime reason that residents of Italy go to Capri. There are more restaurants and cafes in Capri than any other comparably sized place in the whole country. How to Get Capri: Take a train. The fastest train to Naples is Eurostar Freccia Rossa (TAV), which only takes about an hour from Termini station. There are two other trains which take much longer and are less concerned with the amount of time it takes to arrive. Intercity train takes about 2 hours to make the trip and the slow poke of the bunch is Interegionali breaking all speed records at 4 hours. Villa d’Este, located in Tivoli, is the palace of a cardinal of the mid-1500s before priests were banned from having affairs with women. The fabulous gardens, baroque architecture and fountains reveal the wealth that a cardinal was likely to secure during the Middle Ages. How to Get There: Tivoli is about 19 miles outside of Rome and an easy trip by train. Take the Roma-Pescara line train that goes in the direction of Stazione Tivoli out of the Tiburtina station in Rome. Take a shuttle bus from the Tivoli train depot to the town. Travel time: The train ride is about 30 minutes and the shuttle bus adds another 15-minute to your travel time. 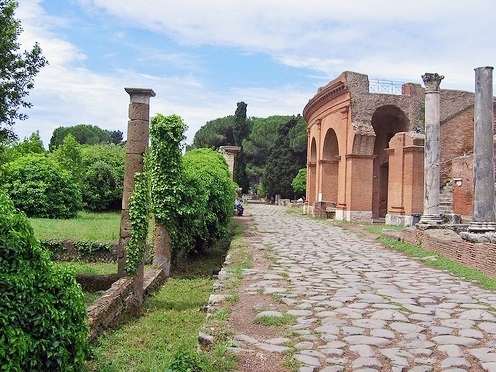 Hadrian’s Villa is the second magnificent villa to visit while you are in Tivoli. This one was first built at around A.D. 117 to 138 for Emperor Hadrian as his personal retreat when court life just got too much for his liking. Even though much of the art work that Hadrian collected in his lifetime was stolen by barbarians at the fall of the Roman Empire, there still remain many pieces of artwork that they overlooked. If you choose to see both of Tivoli’s villas in one day, be sure to wear comfortable shoes. When it comes to day trips from Rome, Pompeii is the place that one shall never miss. What you can see as you walk around the city are the empty shops, remains of residential homes, brothels and baths. Additionally, the political and religious centers are open for your perusal. Plaster casts of actual people that once lived and worked here are sprinkled about the ruins of the city. How to Get There: The best way to go from Rome to Pompeii is by train. However, this is done in 2-steps and there is no way around that. Step 1: Take the Eurostar Freccia Rossa (TAV) train from Rome’s Termini station to Naples. Step 2: Take the Circumvesuviana train from the downstairs platform of the Piazza Garibaldi station. This train is similar to a subway and a new one arrives and departs at 30 minute intervals, approximately. Travel time: The Eurostar to Naples is about 1 hour and the train to Pompeii takes another 30 minutes. Ostia Antica and Pompeii do have something in common: there is no living being. The difference is that Pompeii was buried in volcanic ash and Ostia Antica was deserted by the residents in the 500 A.D. period due to malaria and barbaric wars. There are no plaster people peaking around corners at you but a ghost or two might give you chills. There is an active excavation on-going at the site and many of the artifacts are displayed in the town’s ruins. Wear comfortable shoes and bring a lunch and snacks along especially if you are traveling with children. The one café at the site is always packed and you could wait a long time for your turn. How to Get There: From the Termini station in Rome, take the Linea B metro line to Porta San Paolo at Piramide; from there take the Roma-Lido line and get off at Ostia Antica. Once leaving the station, the ruins are about a 5-minute walk. Castelli Romani (Roman Castles) is not a single town but rather a collection of small hill towns in the Lazio region where wealthy nobleman of Rome built palaces for their personal retreat during the torrid summer months. Most of the villages still boast of at least one or two palace-castles even though many were decimated during WWII. Many of those left standing have been converted to town government buildings and others to hotels. Sadly, many of those that were vacated after the war are in a state of shambles. If you have the time, sign up for one of the Wine tours. They provide the guides and the tours include wine tastings, transportation by private car and tastings of local foods. How to Get There: The best way to see this area is to hire a tour guide. However, there are buses and three different trains to the any one of the small towns if you wish to go it on your own. Travel time: From Rome, it only takes about 30-minutes to reach the villages whether by train, bus or private car. Server responsed at: 04/25/2019 5:59 p.m.